Holiday Gift Sewing for the "Little Divas"
"Make These Shirts For Me!" Oh My! New Shirting Fabric! This is the fabulous Hot Patterns shirt/blouse pattern that I will be making to demonstrate various shirt sewing techniques during my week hosting the CREATIVE MACHINE at Yahoo, and continuing throughout the duration of the Shirt-Challenge. An easy-to-wear modern classic with a retro twist, this sharp Blouse is perfect for any crisp blouse-weight fabric, especially menswear-style cotton or silk shirting fabrics. 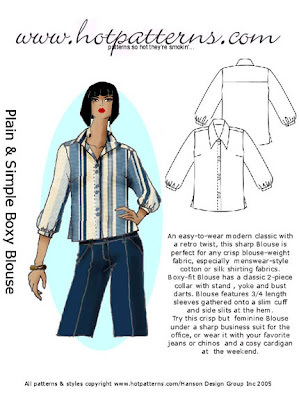 Boxy-fit Blouse has a classic 2-piece collar with stand , yoke and bust darts. Blouse features 3/4 length sleeves gathered onto a slim cuff and side slits at the hem. Try this crisp but feminine Blouse under a sharp business suit for the office, or wear it with your favorite jeans or chinos and a cozy cardigan on the weekend. I have made this pattern before and absolutely LOVE it!